The diamonds you will find in this diamond search can be purchased loose, or set into an engagement ring or jewellery piece. All the diamonds listed here are GIA graded, certified and ethically sourced. Images, videos and sourcing location are available for most diamonds, upon request. When shopping for a diamond through our diamond search, we suggest you first consider the diamond shape and your price point. The shapes we offer include (but not limited to): Round brilliant, cushion, oval, emerald, pear, princess or square, marquise, asscher, radiant, heart, hexagonal, rose cut and even antique cuts like the Old European. 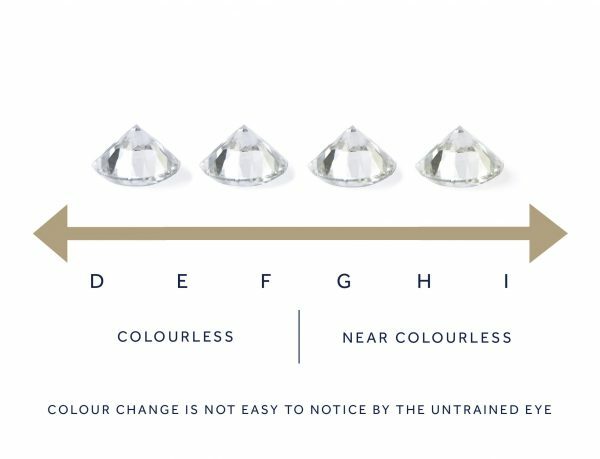 Once you have a shape in mind, we suggest you optimise for the diamond carat weight and its brilliance (measured by the diamond’s proportions and cut grade) and only then colour and clarity. 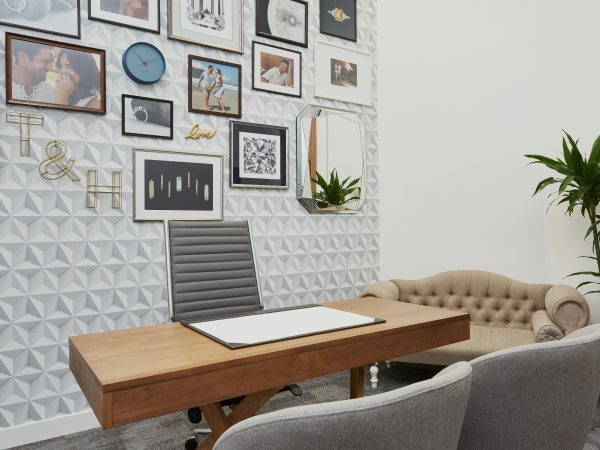 Other characteristics, including the diamond’s polish, symmetry, fluorescence, depth and table are important too, and your diamond consultant can advise on these characteristics (or you can read more about these here). The diamonds listed in our search tool are checked in person by our buyers to confirm they are eye-clean – their natural inclusions are not easily visible to the naked-eye. We then check for their brilliance and lustre, as we believe all our diamonds should have the maximum possible fire and sparkle. This means that the diamonds listed here are checked again in person once you place your order. Once checked we e-mail you to confirm that the diamond you selected is beautiful and that we are proceeding with your order as planned. Sorry, we cannot load any diamonds right now. Please try again in a few moments. Next steps: Add your diamond to a ring or jewellery piece, or let us know if you’d like to purchase it loose. Tax rates are based on the shipping destination of the order. The price shown includes all applicable taxes for the region currently selected. Shipping is complimentary for this order. Please contact your consultant if you have any questions. Filter diamonds by vendors. On the left side are the diamonds provided by each vendor. Click here to learn how to choose a great round diamond. Click here to learn how to choose a great cushion-cut diamond. Click here to learn how to choose a great Oval diamond. Click here to learn how to choose a great emerald-cut diamond. Click here to learn how to choose a great pear-shaped diamond. Click here to learn how to choose a great princess-cut diamond. The princess is often labelled as a square modified brilliant by the GIA when grading diamonds of this shape. Click here to learn how to choose a great marquise diamond. Click here to learn how to choose a great asscher-cut diamond. The Asscher is often labeled as a cut-cornered square step cut, a square emerald cut or an octagonal cut by the GIA when grading diamonds of this shape. Click here to learn how to choose a great radiant-cut diamond. The radiant is often labeled as a cut-cornered rectangular modified brilliant by the GIA when grading diamonds of this shape. Click here to learn how to choose a great heart-shaped diamond. Click here to learn how to choose a great rose-cut diamond. Click here to learn how to choose a great old European-cut diamond. Click here to learn how to choose a great hexagonal diamond. While often confused with the size, carat weight is actually a unit that measures a diamond’s weight. When choosing a diamond, you should consider all 4 Cs to find a beautiful balance. Applicable to round diamonds only, a cut grade refers to the balance of proportion, symmetry and polish achieved by the diamond cutter. Cut has the greatest influence over a diamond’s overall brilliance, with excellent and very good cut diamonds having the highest light return. Diamond shapes other than the round brilliant are not given a cut grade by the GIA. However, you can use this helpful guide to understand what would make a cushion-cut diamond have an excellent or very good cut grade based on its proportions. Diamond shapes other than the round brilliant are not given a cut grade by the GIA. However, you can use this helpful guide to understand what would make a Oval diamond have an excellent or very good cut grade based on its proportions. Diamond shapes other than the round brilliant are not given a cut grade by the GIA. However, you can use this helpful guide to understand what would make a emerald-cut diamond have an excellent or very good cut grade based on its proportions. Diamond shapes other than the round brilliant are not given a cut grade by the GIA. However, you can use this helpful guide to understand what would make a pear-shaped diamond have an excellent or very good cut grade based on its proportions. Diamond shapes other than the round brilliant are not given a cut grade by the GIA. However, you can use this helpful guide to understand what would make a princess-cut diamond have an excellent or very good cut grade based on its proportions. Diamond shapes other than the round brilliant are not given a cut grade by the GIA. 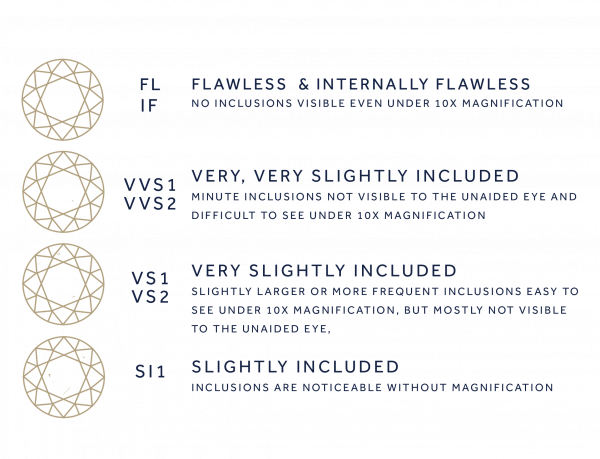 However, you can use this helpful guide to understand what would make a marquise diamond have an excellent or very good cut grade based on its proportions. Diamond shapes other than the round brilliant are not given a cut grade by the GIA. However, you can use this helpful guide to understand what would make a asscher-cut diamond have an excellent or very good cut grade based on its proportions. Diamond shapes other than the round brilliant are not given a cut grade by the GIA. However, you can use this helpful guide to understand what would make a radiant-cut diamond have an excellent or very good cut grade based on its proportions. Diamond shapes other than the round brilliant are not given a cut grade by the GIA. However, you can use this helpful guide to understand what would make a heart-shaped diamond have an excellent or very good cut grade based on its proportions. Diamond shapes other than the round brilliant are not given a cut grade by the GIA. However, you can use this helpful guide to understand what would make a rose-cut diamond have an excellent or very good cut grade based on its proportions. Diamond shapes other than the round brilliant are not given a cut grade by the GIA. 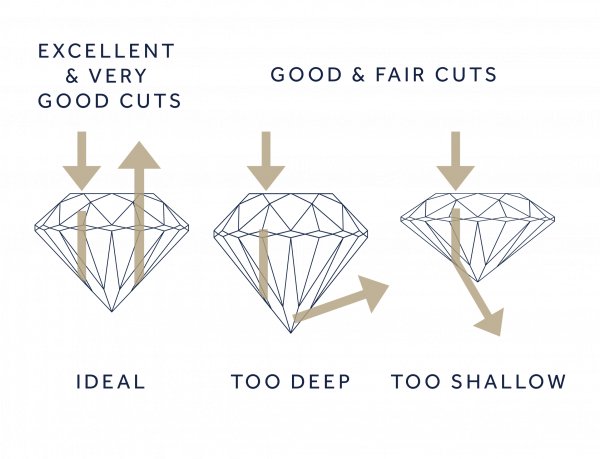 However, you can use this helpful guide to understand what would make a old European-cut diamond have an excellent or very good cut grade based on its proportions. Diamond shapes other than the round brilliant are not given a cut grade by the GIA. However, you can use this helpful guide to understand what would make a hexagonal diamond have an excellent or very good cut grade based on its proportions. When diamonds are formed deep in the earth, they develop natural birthmarks. These slight irregularities are known as ‘clarity characteristics’. These may or may not be visible to the naked eye depending on their size, quantity or placement which is why it’s important to consider clarity when choosing your diamond. White diamonds can have a colour grade from D (colourless) to Z (light yellow). Colour grades D-F are colourless and icy white and grades G-I are nearly colourless, with distinctions so subtle, most are indistinguishable to the untrained eye. We offer I colour grades and above. 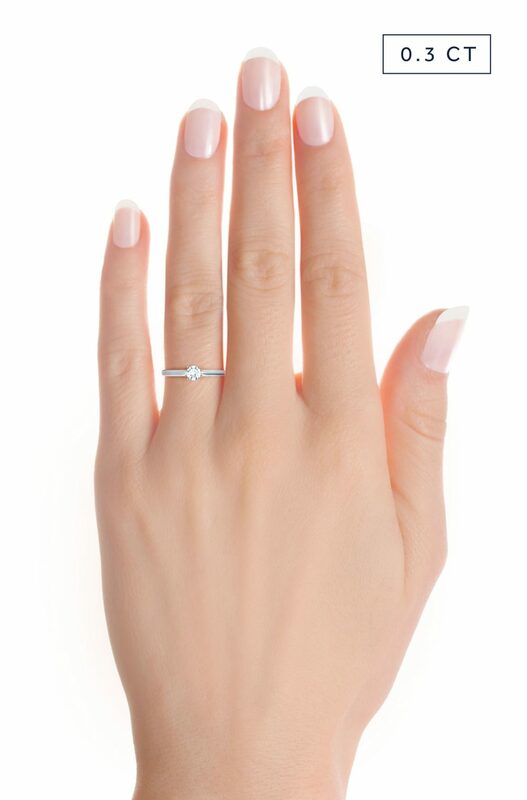 Polish refers to the smoothness of the exterior of a diamond. We offer very good or excellent polish. This means that any marks that may appear on the diamond are difficult, or very difficult to locate under 10x magnification. Symmetry refers to the angles to which the facets are aligned. We offer very good to excellent symmetry which means any symmetry defects are extremely difficult to see under 10x magnification or no defects are visible under 10x magnification. Natural diamonds will emit a fluorescent glow when exposed to ultraviolet light, but their appearance in natural light is not affected. Diamonds with none or a faint fluorescence are rarer than those with a strong or very strong fluorescence. We offer diamonds with none, faint, medium or strong fluorescence grades. What is a CanadaMark diamond? CanadaMark diamonds are hallmarked with certification that details the origin of the diamond, down to the specific mine in Canada where it came from. CanadaMark diamonds are typically priced at a premium as this level of tracking is costly at every stage of the supply chain. Read more about them here. Diamonds that do not carry the CanadaMark are still ethically sourced, but do not have this additional certification. The rough diamond that these non-CanadaMark diamonds came from, carried the Kimberley Process certificate, prior to the diamond being polished, proving its origin and ensuring it too, was ethically sourced.